In games I've attended, there were 4,718 points scored, for an average of 54.86 points per game (a surprising 4.89/game more than last year). The cumulative score was 3,327 to 1,391 for an average score of 38.686 to 16.174 compared to the 35.833-14.143 average last year. There were only 9 shutouts and the most points scored was 78 by Strawn (TX) in a 6-man championship game in Texas. The most for an 11-man game was 63 by Greenville (PA) over Northwestern (PA). The 4.89 jump from last year is the biggest one year movement I've seen. In the past, 0-1 points per game bumps were the norm. For the past several years, I've given my thoughts on the quality of football, fan support, state structure, etc of the states I've seen games in. I'm not going to go as in depth, but I will recap the season later in this post. I'm not going to factor in North Carolina since that was a Home School game. The most notable on this list is South Dakota. Yes, I did rank them that high. And no, they didn't have an overwhelming number of fans. It's a low-population state with a ton of travel distance. And for their 9-man games, they had some very boisterous and enthusiastic fans. On the other end, I pegged Pennsylvania way down just because the state playoff games, unless very close to one of the schools, is just not attended well. The title games were ridiculously under attended. Contributing factors include: Thursday games, several private schools, a charter school with hardly any fans (148 at kickoff by my actual head count), many teams making return trips, the games on live free statewide television and lastly: a lot of the games looked like duds and the few projected 'close' games turned into blowouts as well. And the weather did not help at all. Especially Saturday. The 9 Texas title games speak for themselves. No other state title or semifinal weekend came close. Ohio was second, top-to-bottom. Alabama was just good football. Pennsylvania quality varies throughout the state, but the small-ball is well regarded and the top of the top big schools can put on a show, such as Pine-Richland or Archbishop Wood. #5 through #11 is just someone had to go somewhere. All very close. South Dakota and Minnesota get high marks for quality of 'consistency'. Teams are generally well trained and conditioned, but might not be the biggest or fastest kids out there. Good blocking, good tackling form, good grasp of the plays, etc. They're just not 'that good' in terms of brute stretch or athleticism. You're not going to confuse anyone from the northern midwest with kids from the southeast. The worst of the bunch is New York. I saw an eventual state champion and one of the worst teams in the state, apparently. Didn't attend the Indiana finals this year, so Texas' UIL Finals were back to #1. Even with me ducking out before the Saturday games. South Dakota was just a fun experience. Would I do it again? Logistically it probably wouldn't work out. But, it was fun. Had a hotel across the street from the stadium (a little overpriced for the quality of it), and it's a small college town with lots of options. The day/night split like Pennsylvania and West Virginia gives options for eating out between games. The only downside is the cost of tickets for such a small venue (smallest state final venue I've been to, holding less than 11,000 fans). Pennsylvania was just cold and the games were all one-sided. And a lot of returning teams meant the 'big' fan bases didn't materialize except for Homer-Center. Had the weather been better, Quaker Valley would have brought more fans. And lastly, was the Bob Allen Pigskin Classic in Danville. This was a dud from the word go. August afternoon. Staring right into the sun. No programs, rosters, souvenirs, etc. Small lackluster crowd for the first game and the second game against a team playing their first ever football game and 30-0 final made the whole night boring. And the walk to the bathrooms or concessions was ridiculous. Unlike in previous years. There was no debate which game was the best. Easily, without a doubt, it was Highland Park's improbable comeback against Manvel who then was stopped at the 1 yard line on a pass play as time expired. After a few weeks to settle my thoughts, I still think it's the greatest high school football game I've ever attended. Second place, unfortunately, goes to Etowah-Guntersville. A 20-0 deficit comeback to make it 21-20 only to see Etowah score late to take a 26-21 lead. Guntersville's last gasp comeback attempt didn't materialize. Chronologically, Britton-Hecla's win was my first and only overtime game of the season. Britton-Hecla scored first to take a 44-36 lead, and then just as Corsica-Stickney was running it in, a costly fumbled ended it and gave Britton-Hecla the championship. Two days later, the big school division featured district and city rivals: Washington and Roosevelt from Sioux Falls. Washington was 2-time defending champions and Roosevelt had scored late. Opting for two points and the win, the conversion attempt was no good. Giving Washington their third straight title. And in a similar vein, Imani Christian had trailed, and when they scored to make it 35-34, went for two and failed. Their comeback attempt ended. There were a lot of 'bad' games. Quite a few that just will fade from memory other than marking down I was there. The worst, though. That's a whole other category. The worst game, easily, is the Home School game. And it was all one-sided. I debated whether to even count this as a 'game'. That's how bad it was. For the eight straight year, I'm just going to use calpreps to rank the teams I saw. Overall, they seem to slot teams at roughly where I think they should be. The bottom two easily qualify. The two HomeSchool teams. Unfortunately, I do agree that Sebring McKinley was the worst 'regular' team I saw in person. Those kids worked their butts off in that game against #11951 Lowellville, but with only 16 players it was an uphll climb just to score some points. Aside from them, I was surprised Whitney Young was that far down. I figured Avella would be second worst. Elsewhere at the bottom, I knew Cochranton's record would pin them down however I was thinking they might not be down that far. Northgate really surprised me. Thought they were better than that. Lake Shore (NY) made a lot of sense being that far down. This was the sixth straight year seeing primarily Ohio or Pennsylvania games. Our goal was to attend games in and visit new places. That's what lead us to South Dakota and also U.S. Bank Stadium in Minneapolis. The third stadium I've attended games in Minneapolis. Taking time to travel to new places does put a limit to just how many games we could attend. As I've alluded to in the past. Gas is a very minor expense thanks to my wife getting free gas through her employer. This only applies around Ohio and Pennsylvania. So, longer trips require actually paying for gas. Which, was only $820.22 on the season. Food on our trips was by far our biggest expense. And lastly, there was $425 of 'miscellaneous' expenses. This included non-food items bought along the way. Other souvenirs and mementos. The only expense of the entire season was Disney World park tickets. I included the hotels and food. However, the tickets and passes, I did not since they weren't football related. All tolled, I spent $8,100.17 to attend the 86 games this season. That came out to a whopping $94.19 per game attended. A marked increase from the $67.45 per game I spent last season. Though, our goal of 'seeing games in new places' means traveling. A lot. And we didn't really go cheap with hotels as we have in the past. Due to my wife's schooling and our daughter, my wife didn't attend nearly as many games as she has in the past. We're hoping this season is better as we're working around her schedule for most of the upcoming season. Our original plan was to take our daughter to Disney World in December and at the same time attend the Florida State Titles in Orlando. My in-laws had other ideas, and wanted to go to Disney World in September. Since we had decided to go to Florida, our plans for 2017 did not include Texas, originally. We had already considered our 'big trip' to be a drive out west to South Dakota for their titles and to cross that state off the list. With the change to September, driving there and back meant seeing games in a few new states. Virginia and Alabama, specifically. We did have a hurricane to contend with, though. The drive down was simple enough. A path through West Virginia on Thursday included a game at East-West Stadium in Fairmont. The next night was a stop in Galax, Virginia for their game against Carroll County. I had been to Galax before as it is an 'independent city' and for county-counting purposes, seperate from the county surrounding it. I didn't write a recap as I had a hurricane to plan around and a stay in Disney World. So, I'll make a small recap here of Virginia Football. For the most part, it's interesting. The rural southwest tail includes many schools dotting the terrain around Wytheville and I-77. Galax was the furthest drive, though there were other options if time were an issue. However, we made it with plenty of time to check into a hotel and get to the stadium. The stadium sits in a bowl that is quite steep behind the school. You walk down the hillside or the few actual stepped paths after paying for your ticket as you enter the parking lot. The stadium just installed turf for the first time. The stands themselves are sloped. From right to left, the actual bleachers slope downhill. The concessions and restrooms are at the far 'lower' end of the field and it's quite a walk there and back including the steep incline. The visitor side is incredibly small, and many people resort to standing or sitting on the grassy areas around the stands. Including standing outside the fence and watching, presumably, for free from the street. After the game, there was the issue with the hurricane. Especially which path it would take. The initial forecasts were that it would track east and slam into South Carolina or skirt the east edge of Florida and devestate the coastal areas. So, we took a chance and went slow into North Carolina to attend a Home School game in Asheville. There was a Saturday game near Staunton, Virginia, but would have been a considerable backtrack to the northeast. After attending the Home School game, we drove west to a small hotel we've been to before in the Smoky Mountains. Price is reasonable, and it put us further in lane and presumably away from the hurricane's path. The next morning, it was obvious the hurricane was moving further inland. Which meant we needed to head back east. My wife's family had already made it to Disney World from Miami to weather the storm there. Unlike their home, they had power the entire time and the park opened as planned the next day. For us, however, we stopped in Elberton, Georgia after touring a few of the more interesting stadiums between Bryson City, Tennessee and Elberton. Elberton is home to the Granite Bowl. A classic bowl depression stadium. Though, slabs of granite were used in construction rather than concrete. Which gives it a unique feel. A game there would definitely be quite interesting and something I'd consider for a bucket list item in the future. The storm, though, stayed west and what little rain and wind we got was negligible. After an early morning start, we headed south. There may or may not have been a curfew in effect. We never looked. There was enough traffic on the roads that it seemed immaterial. Our big issue was by the time we hit Waycross, we ran into an area without power for the first time. Only one gas station was open, so we sat in line to fill up. We also stopped over at Waycross's Memorial Stadium. A beautiful old baseball stadium converted into a traditional football field with a new visitor stand cutting through shallow right field. Interesting, the grandstand's roof covers just the corner of the endzone. Outside, the stadium stands impressively along a major thoroughfare. With our car fueled, we had enough gas to make it to Disney World. Which would come in handy. Driving US1 mostly through Georgia and into Jacksonville, we avoided much of the problems with traffic seen on the interstates. The only real issue were the people who consistently fail to stop at unlit traffic lights. Instead opting for a much flimsier notion that they mean 'go'. We spotted more than one accident because of this phenomena. GasBuddy was great at showcasing which stations weren't operational. And most along I-95 were out of service or out of fuel. There was, however, a lot of traffic. Once we reached I-4 it was following twitter for reports on gas stations reopening after the curfew was lifted. Wawa stations were open, selectively, and it took stopping at a few before we found one absolutely swamped with traffic. But, we did get gas, bought some of what was left on the shelves, and some made-to-order hoagies. This detour spent over an hour between waiting for the pump and waiting inside for food. Checking in at Disney World was a breez. Even though a hurricane had just passed through in the past 24 hours. Great thing about Disney after a hurricane? No lines. We started when the gates opened at Magic Kingdom and had seen everything in the park by early afternoon. Plus, it was unseasonably cool and breezy for mid-September. We even had time for dinner at Epcot that night. The next day was Animal Kingdom and then back to Epcot for dinner. Crowds had picked up and by the third day, Epcot was quite crowded. Dinner the second day was at the Coral Reef Restaurant underwater. Which was definitely a highlight of the trip. Our daughter was a bit fearful of the full-costumed characters, though she loved meeting some of the 'real person' princesses. The Dumbo ride was her first ride and she loved it. Without a line, we went on it several times to start our first morning there. Her favorite part of the stay was actually the hotel. The All-Star Movies Resort where we stayed (one of the 'cheap' resorts but compared to the higher priced ones definitely worth it if you have kids) had a giant pool where our daughter loved early morning or late afternoon swimming. Due to a quirk in scheduling, McCreary Central (KY) was hosting Lexington Dunbar (KY) on a Saturday night in south central Kentucky. In order to get there at a reasonable time, meant finding a more 'northern' Alabama game on Friday night. My original plan was to see a game in Bibb County High School on the southwest quadrant of Birmingham. Instead, we looked for something in the northeast corner of the state and settled on four different games. The other planned trip started as JUST a trip to South Dakota and back. A quick 900 miles out and 900 miles back. However, it's never that simple. Partly because the MSHSL Semifinals coincided with the following weekend, we decided to head there after South Dakota. Had it just been the 7 state titles, we may have opted to head straight home. But, with 14 games at the new US Bank Stadium, it was an obvious enticement. I had previously seen games at the Metrodome and TCF Bank Stadium during the new stadium's construction. 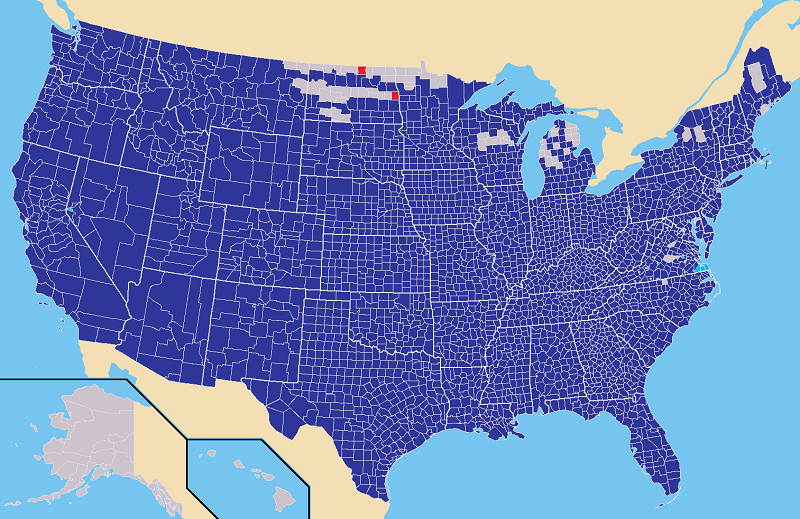 The trip between Vermillion and Minneapolis included a trip through eastern South Dakota to collect the last remaining counties. As well as a short drive north into North Dakota to cover the southeast corner. Then, after dipping down into South Dakota and Minnesota for three more counties a trip straight north to Fargo. From there, it was practically due east to Breezy Point, a small town north of Brainerd where we called it a night. The next day was a drive south to our hotel, the DoubleTree in downtown Minneapolis. We ate at the Indian restaurant a block from the hotel for dinner. The next day was a short bus and rail ride to the stadium. My wife and daughter lasted one game before deciding to go check out Mall of America, which is conveniently located at the end of the Blue Line which passes right beside the stadium. They returned for the night game. Friday was an all-day at the mall for them while I went to the games. Saturday, they elected to explore downtown Minneapolis and the Nicollet Mall region of downtown. The last trip was entirely by happenstance. I had planned, originally, to see the Florida titles during "Week 16", in place of the PA titles and two weeks prior to Texas' finals. My wife had planned to fly to Florida after New Years to visit her family again before school restarted for her. However, ticket prices were so much cheaper prior to Christmas that my wife wanted to take a trip from Sunday to Sunday before Christmas. Returning on Christmas Eve. I had no desire to head to Florida a second time in four months. And I hadn't planned on it, either. So, after booking her airfare, I asked if she'd mind if I drove to Texas for the title games while she was away. So, that's what I did. The only caveat was I had to be back at Pittsburgh International Airport Sunday evening to pick her up. Which meant leaving right after the Friday night game at AT&T Stadium. I still managed to see 9 games that weekend, and the last game was easily the best game of the entire year. And possibly ever. Highland Park-Manvel. The drive home was fast. 145 miles Friday night. It was 889 miles driven on Saturday between just west of Texarkana and Jeffersonville, Ohio. Sunday was a short drive east through Columbus with a stop over to visit a friend and return his camera he lent me. Then onto PIT for a 5pm arrival, a stop at Applebees, the only place open on Christmas Eve, and then home. Wrap a few more gifts and assemble a playset for my daughter. Then Christmas morning. Followed by a drive to my parents for Christmas dinner and more presents for my daughter. I'm going to venture off course a little for this next part compared to years past. This is a breakdown of various game expenses. Highs, lows, and just oddities. The cheapest ticket for a regular season game was actually in New York. Lake Shore (Angola, NY) only charged $1 at the gate for a Thursday night. That $1 also included a free two-page program, folded to create six pages total. It had the basic information, including the two dance teams. This was important, as it seemed like the only reason anybody stuck around for this one-sided game was the grade-school cheerleaders performed at halftime and then EVERYONE cleared out. Less than 10% of the fans had stuck around for the second half. Which, I don't blame them. But the mass exodus was still surprising. The average ticket in Ohio was $6, while the average ticket in PA was $4 to $5. The most expensive was in Tennessee, where Carter charged $8 for general admission. It was $10 for reserved on the home side middle stands. Western Reserve Academy had free admission. Though they made up for it with their hotdogs. They were well worth the money. South Range's new stadium was $7 for a ticket at the door and $5 for a commemorative program. East Fairmont (WV) and Galax (VA) both charged $6 for admission, and both charged $5 for programs. Galax did include 'parking' as part of that ticket since you paid your total as you pulled onto the property. I'm not sure how much it'd have been if you just walked there. The Home School game in North Carolina was $5 with no programs, rosters, or even anything resembling letting you know who the two teams were. Alabama's prices were a bit higher as Montgomery's city league team, Sidney Lanier was $3 to park and $7 for a ticket. Guntersville charged parking, but I walked to the game. Their ticket was $6 and $5 for a program. McCreary Central (KY) was a $5 ticket for their very little stadium. No programs were sold or handed out. No rosters, either. There was a booster club booth setup that sold baskets along with knicknacks, but nothing about the team specifically. Burgettstown (PA) was only $5 for a ticket but their homecoming-themed program was a surprising $8. It was rather nice. And the program includes a ton of historical team data such as records, season standings, etc. But that's a bit much for each individual game. Sebring McKinley (OH) only charged $3 for a program, but the standard $6 for a ticket at the gate. Blackhawk (PA) had to move their home games to Geneva College's Reeves Field after their stadium was deemed unplayable (raw sewage had leeched into the ground and though they were already in the planning stages of building a new stadium at the high school to replace the old stadium by the elementary school, they had to find a temporary home. Their tickets were $6. A near calamity happened during my trip to Bellevue to see Northgate host Summit Academy. First, I had driven my car and somehow forgotten my wallet. I didn't realize this until I was walking up to the ticket booth. Luckily for me, I always have spare cash in my car. So, I had ten dollars that covered the ticket ($5) and program ($5). I hadn't planned on a night game as there was none anywhere in the vicinity. Instead, it was just to head home and over to Covelli Centre for a Phantoms game that night. For the playoffs, PIAA District 10 charges $5 for all tickets, at the door or presale. And programs are rather simple, but only $2. The other thing with PIAA games, is that the programs generally cover more than one game. So, if you're seeing a game in southern D10, the program will probably cover a Thursday, Friday and Saturday game. Tickets to the John Hay-James Rhodes Senate Athletic League Championship was only $5 which included a printed program with rosters. WPIAL Finals for 1A and 2A were $10 each, though I was under the impression it was $10 for both as they did with the Heinz Field games. The state semifinal between South Range and Eastwood was $10 at the gate. The two Week Zero Kentucky bowls both charged $10 each with Lincoln County's Death Valley Bowl giving away free programs and personal fans. For other playoff games, the South Dakota title games were $15 per session. This is the second highest per-game cost I've found next to Ohio. The only reason it's less is of the seven games, two games are one session on Thursday morning. There's a morning and night session for all three days. The primary reason is the very small stadium is listed at 11,000 seats, but with the configuration, it holds maybe 9,000. And the far side of the field is 'students' who have general admission. The home side, therefore, only holds about 7,000 at most. And that's for both fans. The games are aired live over South Dakota Public Television. But, being the only domed stadium in the state, it makes sense to host them there. Regardless just how small the stadium. Programs, though, were only $3. Minnesota plays all 14 state semifinals and all 7 state finals at the new US Bank Stadium in Minneapolis. The games are spread out over three days for the semifinals, and two days for the finals. Each day of the semifinals cost $14 at the door. They do not have presale for upcoming days. Which makes it a pain having to walk in the cold to the ticket window on the side of the stadium and back to the west endzone promenade to enter through the security checkpoint. Which is located far outside the stadium in heated tents. The only benefit is the Metro station is right across the street from the stadium entrance and exit. Programs were real nice half-sized magazine quality for only $5. Over 100 pages all in color. Very similar to Indiana's programs for their finals. The interesting thing about them is they must be printed well in advance and possibly sold at quarterfinal games as well since they contain info on all eight teams in each classification. West Virginia title games were $8 a ticket for each of the two games I attended. They did previously have a three-day booklet that's cheaper but since I attended a PIAA Semifinal on Friday night only needed the two games. For the night game, someone in the parking lot had tossed several unused tickets. So, the night game was free admission. Also, the guy selling programs was a Browns fan and liked that I had a Browns shirt on. So, free program. Can't go wrong with that. Intermission between the two games was spent at the Wheeling Island Casino across the parking lot from the stadium at the buffet. I had planned to gamble, but instead watched college football games with LCF, who was at the games as well until it was time to head back to the stadium. The Pennsylvania title games saw a price increase from $7 to $8 per ticket. I figured as much since the state semifinals went up to $7. However, the big change, was that the ticket stub from the early game couldn't be used to get into the night game. Several fans were angry that they wouldn't give them a stub back after going through security. The only notification I found was a small poorly printed sign taped to the ticket booth window saying "Tickets are good for one game only". Just as Texas prints "No Reentry" on their tickets, they do actually let fans reenter if you scan your ticket out and get a hand stamp. This unspoken benefit to games in Pennsylvania didn't affect many people. As someone only planning to attend all the games, or at least all the games that day would care. But it's certainly interesting to find out, possibly, how many fans had attended more than one game on a stub. Considering the paltry attendance at the PIAA games to begin with, I can't imagine the extra $8 a day was a noticeable jump. Besides, free basic cable broadcasts of the games statewide make staying home an inviting proposition. I know that Wilmington, from Mercer/Lawrence County line, had a lot of people watching on TV that I never thought would watch. My aunt and uncle said they watched the game despite no affiliation to Wilmington and absolutely no interest at all in ever even driving to New Wilmington for one of their games, let alone to Hershey. Yet, they watched because the game was widely publicized on print and radio and word of mouth on facebook. Considering Wilmington lost 48-0, staying home might have been the wise decision anyways. And lastly, was the Texas title games. Tickets were once again $15 per day for all four days. With the fourth Thursday game now being played on Wednesday night after the 6-man games finished, it was three games per ticket. And they allow presale. So, only one trip to the ticket window as the entrances to the stadium are in each endzone. Parking, however, was much different. In the past, it was always $10 cash. At some point, they started accepting credit cards. This year, however, they screwed it all up. It became $15 for cash, or $10 for credit. Why? Who knows. However, this made the vast majority opt for credit. And instead of the ease and simplicity of just handing over a $10 bill and getting your window decal for proof of payment, you now had to wait for a card reader to accept the transaction. This greatly slowed down the lines. They also, unfortunately, do not direct traffic around the stadium nor do they changing the light sequences. There's far too many left turning lanes used to get to lots which gridlock everything when cross traffic decides to block the box. The one lone traffic cop was besieged with idiots who kept crowding the intersection to one parking lot. The primary entrance (from a road that was closed in one direction) required driving past that entrance, making a left, and another left into a lot. Four lanes of traffic all tried to merge into two entry lanes held up by two attendants trying to process credit card payments. It was, essentially, a nightmare that needs revisited next year. Programs were $10 this year, up from $5, and I bought two souvenirs that totaled $32 ($20 for a UIL State Championship football and $12 for a drawstring bag). Seven years ago, I attended 55 games. I attended 73 in 2011. I attended 100 in 2012 and 100 in 2013. In 2014, I attended 127 at a pace I doubt I'll ever match. I attended 97 in 2015 and last year attended 84. This year I attended 86. For a total of 722 games in the past 8 years. And 667 in just the past 7 years. And 594 in the past 6 years. Having now added Virginia, Alabama, and South Dakota, I've now attended games in 36 different states. And some form of high school, college, or professional game of any sport in 41 different states. ALso, during this year's road trips, I've continued marking off every new county I visit. During this past year, I've marked off 71 new counties or independent cities. As for December 31st, I have 101 counties or independent cities to go. I also marked off my first state since 2015, when I visited my last county in South Dakota on 11/13/2017. I generally don't eat stadium food. When I traveled more, I liked to see the regional variations of food. Such as Tamales in Albuquerque, or Ribeye Sandwiches in Buffalo, Wyoming. So, I'll include restaurants along the way as well. There are two notable stadium foods, though. Which I will get to. This was the best hotel of the season. For a downtown hotel, it was incredibly cheap by comparison. Mostly it's location on the far southern end of downtown made it less favorable. The benefit, though, was that there was a bus stop at the corner by the hotel, which made a straight line north to the Metro. For $1 a day, you got round trip to and from the stadium. And there were plenty of options around the hotel for food. The suite itself was nice. Including tax and parking, the total was $108/night. The suite feated a full wrap around couch, two flat screen HD TVs (one in the living room and one in the bedroom), two beds, and all the regular amenities you'd find at a upscale hotel. The primary benefit to this hotel was the location. The restaurant was closed, and was told a new owner had plans to open it in the spring. But, it was across the street from the DakotaDome, which made this a good choice. However, the fact parking was free at the game meant close proximity to the stadium wasn't the financial benefit. Though, for a few games it may have been much closer to walk from the hotel than to find a legal parking spot. Also, since Vermillion lacks hotel space, the price is already quite high and they knew well in advance this weekend would command a higher price. Total was $101/night for four nights. Not exactly the most financially sound decision going to South Dakota's title games. Though they were fun. This was a bizarre stop in every sense of the word. It was well away from our line of travel between Fargo-Brainerd-Minneapolis. It also was odd in that it really was a timeshare being rented out. Essentially, Breezy Point is a small vacation spot and the Commander Motel is a serious of rooms owned by individuals, who can then put them up for rent. The price was incredibly cheap compared to the surrounding areas. But, you don't get your keys or check in at the Motel. You go a block over to a community center that has your keys and check in there. The room itself is big, but it's not the most well kept, either. Still, it's cheap. And if you are wanting to be in that area on purpose, it makes for a good place to stop. Now, this is a small motel. A relic of the old fashioned roadside motels. Giving that we were driving around sparsely populated South Dakota, there's not many options. Faulkton isn't exactly on a beaten path. Total cost was $69 for the night. Simple room, pretty nice overall. Given the possible options within a hundred miles, this was easily the best. This was a priceline deal that was only $36.32 total for the night. This was a very nice high end room. Beds were great, carpet, etc. The only exception was the lack of a fridge. However, a normal $80 room for $32 plus tax was worth it. Plus, at the casino I came out $50 ahead, so that easily covered the room for the night anyways. Their restaurant, though, wasn't the greatest. This is primarily for location. It's a good cheap hotel only 1.2 miles from AT&T Stadium. I had stayed here a few years ago when it was a Motel 6 under renovations. Apparently they upgraded to the Quality Inn brand but the prices were still cheap. $48.55/night for the three nights I was there. Friday night or Saturday night would have upped the cost. Surprisingly, this was one of the most common hotels we found through Hotels.com. They're a decent chain. The hardwood floors are a bit annoying. We had rooms in Fairmont (WV), Montgomery (AL), Whitley City (KY), and Harrisburg (PA). First, there's one point that has to be made about stadium food. Lincoln County (KY)'s Ribeye Sandwiches were well worth the price. Secondly, and I'll keep saying it, the best food deal at AT&T Stadium is the Brisket Nachos for $12. It's only $2 more than the Ultimate Nachos and between the brisket, cheese, and barbeque sauce, it turns it into a giant glob of goodness that requires a fork to eat. Unfortunately, they don't open that stand on Wednesday or Thursday. However, it's well worth it on Friday or Saturday. Normally, there's a few places that are 'must stops' along the way. These are regional fast food chains. Though, I just found out Culver's has locations in Texas. I've always only ever stopped in the midwest or at the very least in Columbus. I've never looked for one further south than Iowa. There's also Lee's Chicken, Pizza Ranch, and Whataburger that I always make a point to stop and eat there on my way through their areas. Aside from those, there's some really good places to stop and eat and here's my favorites of the bunch. This is about the first great BBQ place you'll find in Texas. It's literally on the Texas border with Arkansas as it is on the west side of State Line Road. First, and foremost, this place has some amazing food. The brisket is some of the best I've ever had. You can cut it with a plastic spoon, that's how great it is. The chicken is great and though dry the two barbeque sauce options are amazing. One is a true barbeque sauce and the other is a mustard blend that goes great with the chicken. Their sides, including the twice-baked mashed potatoes are phenomenal. And for barbeque, the prices are in line with almost anything else you'd find. The restaurant is actually an old converted gas station that has all the kitsch and charm you'd expect. The kitchen is actually their outdoor food truck parked alongside the building. They also feature Oak Cliff Soda, and Sweet Tea made with real cane sugar. This was such a great stop on the way into Texas that my trip home via the southern route to avoid a winter storm rolling through Missouri meant I had to stop on Saturday morning when they opened at 11am. It's that good. We stopped here as a junction to head south into Wisconsin while county counting. Our second pass through to then head north to Kewaunee County included a stop here at the small gas station/cafe at the corner of US 45 and US 2. We're glad we did. The food was amazing. I had the fried chicken and my wife had a taco salad. My daughter had a bit of everything and is usually apprehensive about anything that looks as messy as the Taco Salad. The thing was gargantuan. And the food was quite cheap for what you got. If you ever happen to be at this small junction in southwest UP, you need to stop. This place was a surprise. We were in the middle of nowhere and had just started traveling east through North Dakota. The first restaurant on our route was the Roost Bar and Grill in Ashley. It also was the only restaurant for miles. So, we stopped. There was no one there. And not that it was boarded up or closed. Just, literally, when you entered there was no one there. After hanging around the main entrance looking for someone, we finally were greeted and told the kitchen doesn't open until evening. She could make a pizza. However, there was a restuarant across town that's open. Google Maps and everywhere else had it listed as closed. It wasn't. Instead, it was one of the best meals of our South Dakota/Minnesota trip. The food is cheap. And you get a ton of it. I ordered a double-cheeseburger and mini-tacos. My wife had a single cheeseburger. A double only cost $2 more. It literally is a double. The patty itself is at least half a pound. If not more. You basically have to disassemble the burger to eat it. It was amazingly good, though. Our meal wasn't completely without a banana cream kuchen and apple kuchen. Both were well worth it on their own. Right now, I have a general idea of what games to attend next year for early and post season. Regular season and early playoff rounds will be as the schedule dictates. For the most part, we're planning to make another trip to Florida, though this time in August. Not exactly ideal. If the schedule holds as in the past, there should be 4 or 6 games played in Montgomery, Alabama During Week Double Zero (i.e., two weekends prior to Ohio or Pennsylvania's first week). Then, visit Lego Land and Universal Studios before returning north through Georgia and stopping for the Corky Kell Classic. The schedule means Thursday games in Macon won't happen this year, as those were moved to Rome. But there's a good chance a Thursday game somewhere south of Atlanta will be possible. Instead of two games at Georgia State on Friday night, we'd probably find the best regular game we could around Atlanta. And then see as many of the 5 Saturday games at the new Mercedes-Benz Stadium. Marking another new stadium from my list. With my wife's upcoming schedule, playoff trips won't be as common. I may toy with the idea of going to Iowa. But it's doubtful. However, I will make the trip to Indiana on Thanksgiving Day weekend. As my wife really liked Lucas Oil Stadium and consider it her favorite, even over AT&T Stadium. Week 15, though, will be a trip to Tennessee for their 9 state championships. After seeing several Tennessee games over the years, it would be interesting to see their state finals. Week 16 would be back in Hershey once again. And with Texas' late start again, the Week 18 games at AT&T Stadium should make a trip through Texas and to Florida quite possible. If my wife's schedule doesn't allow, I'd drive down to Texas and then travel east to Florida while my wife and daughter fly down. If not and we can drive, we may still miss the Saturday slate of games in order to make south Florida at a reasonable time before Christmas. Long term, though, we still have some plans in the works. For 2019, we're planning to fly to California for their five state championships at Cerritos College in the greater LA area. It's a shame Banc of California Stadium didn't win their bid to host. Since my sister lives agonizingly close to the future venue (it's just east of the Coliseum). That would forego a trip to Texas that year as we'd like to take a meandering northern drive home through the rockies. Or, at least that's the initial plans. Also, sometime in the future, is a double-dip in Kansas and Arkansas to visit those two states. This will probably be sometime in the next 3-5 years. Kansas plays all of their games on the same day with almost each game at a different stadium. Except the 8-man games are played as a doubleheader. Then, head over to Arkansas for their last weekend of title games in Little Rock. Logistically, it works out but might not be worth it overall. We may, instead, opt for just a regular season trip if scheduling allows it. We also have some general plans for the northeast and northwest. And, of course, we've already began looking into trips to Alaska and Hawaii for when the time comes that my daughter can more appreciate traveling to such an extent. A game in Barrow will not be cheap. Between airfare, hotels in Barrow, rental car, etc. It's going to be several thousand. But, it's in the long term plans. Regardless of what may or may not transpire, wherever we go or whatever games we see, we'll have fun exploring the world together. As always, thanks for your amazing summaries and reviews. I know i always look forward to them.